In parts 1 and 2, I described the overall radio access network architecture and best practices for deployment at physical layer which is primarily fiber for the links between the base band unit (BBU) and remote radio heads (RRH). In this post, we will study best practices helping us address issues encountered beyond the physical layer. To help understand the best practices, we need to understand the transport protocol between a BBU and RRH; Common Public Radio Interface (CPRI). CPRI was introduced in radio networks many years ago, but has not been visible until recently because it was mainly deployed in relatively short links between BBU and RRH at cell sites. Cloud RAN deployments are making this protocol more significant for planning, installation, and maintenance tasks. While there are new Ethernet based fronthaul protocols in the pipeline for 4.5/5G, one can expect CPRI to stay relevant for many years to come. CPRI was initially introduced as an internal interface (Figure 1) between a Radio Equipment Control (REC) and Radio Equipment (RE). The REC connects to the mobile core through the backhaul network, while the RE delivers the air interface for the link to antennas. In 2G/3G systems, both components typically resided in the same physical location at the ground level. This was advantageous from the perspective of equipment maintenance and power/cooling management. However, it caused a major issue as operators started to deploy 4G systems several years ago; including the link loss on the coaxial cables from the ground level to the antennas. This challenge fueled the demand to place the RE closer to the antenna on roof tops and towers using fiber; new terminologies emerged Remote Radio Head or Unit, Fiber to the Antenna etc. RRH/RRU and RE represent the same logical entity. REC, BBU, or DU (Digital Unit) also typically refer to the same function. With densification of radio access networks, it became difficult to find sufficient locations for placing the REC; this led to placement of REC farther away from RE’s in operator’s central offices; Cloud RAN’s are being deployed in large volumes in major wireless operator networks now. The CPRI interface is a digitized layer 1 and 2 interface that carries User, Control and Management (C&M) and Synchronization services. REC and RE are typically connected in a point to point fashion. But CPRI allows daisy chain topologies in which multiple RE’s are connected through a single fiber link in a chain configuration. CPRI permits for electrical interface, although the overwhelming majority of deployments rely on fiber. CPRI line rates vary between 614.4 Mbit/s to 24330.24 Mbit/s using 8B/10B. Legacy CPRI deployments apply 8B/10B encoding, new RE’s take advantage of 64/66B encoding for more efficient use of fiber resources. While the encoding scheme applies familiar Ethernet encoding schemes, the transport layer is dependent on Time Division Multiplexing (TDM) layer 1 technology. Layer 2 is primarily composed of user plane traffic in digital In-Phase/Quadrature (IQ) data. 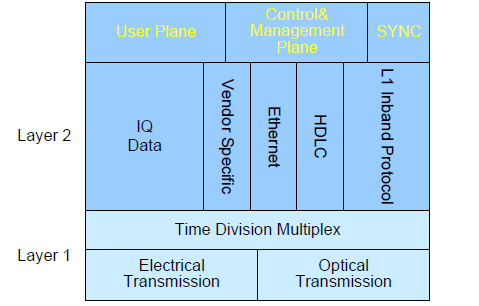 Beyond IQ data, three channels are available for C&M information: Ethernet, HDLC and Vendor Specific bytes. Finally, there is an allocation for exchanging Layer 1 inband protocol data that is used for link signaling for system startup, and maintenance purposes. Alarm Indication Signal (AIS) and Remote Defect Indication (RDI) belong to the last category of CPRI layer 2 content. The CPRI signal is characterized by hyperframe composed of 256 Basic Frames (BF). Each BF starts with a control word. The remaining part of the BF can be used to carry IQ data. So we have 256 control words that are allocated to different purposes, e.g. synchronization, Ethernet/HDLC C&M channel, or L1 inband protocol. IQ is the main constituent of the hyperframe, and there are various ways of mapping IQ data into the hyperframe. In summary, CPRI became more important with deployment of 4G/LTE networks and the need to place the RE’s closer to the antenna. It is a TDM-based technology that connects REC/BBU/DU’s and RE/RRH/RRU elements primarily over fiber links. It is a synchronized technology that carries the user, synchronization, and control/management data.